Taste: The chicken thighs have a perfect combination of warm spice with a hint of sweetness. Every ingredient compliments each other perfectly. Texture: Since the thighs are broiled the spice-rubbed edges are slightly crisp while the meat inside is tender and juicy. Ease: So, so so easy. This recipe takes less than 20 minutes from start (preheating broiler) to finish (on the table). Appearance: While a cut of chicken isn’t exactly the most dazzling specimen on earth these thighs still look mouth-watering. Pros: Amazingly quick and easy, perfect for dinner after a long day. Would I make this again? I’ve added this recipe to my weeknight dinner repertoire. Originally when I added this recipe to my weekly menu and shopping list I hadn’t planned on photographing and posting it here. I guess I wasn’t expecting much of it. So when I took my first bite and was overwhelmed by the depth of flavor I was pleased. This chicken thigh recipe is just about as perfect as a week-night meal staple can get. Its flavorful, quick, easy, healthy, inexpensive, and only dirties a few dishes (bowl, broiler pan, tongs, measuring spoon). Does it get any better than that?It goes perfect with steamed veggies or a side salad and some rice or bread. What are your favorite easy weeknight meals? 1. Preheat broiler. Combine first 6 spice ingredients in a large bowl. Add chicken to bowl; toss to coat. Place chicken on a broiler pan coated with cooking spray. Broil chicken 5 minutes on each side. 2. Combine honey and vinegar in a small bowl, stirring well. Remove chicken from oven; brush 1/4 cup honey mixture on chicken. Broil 1 minute. Remove chicken from oven and turn over. Brush other side with remaining honey mixture. Broil 1 additional minute or until chicken is done. This looks great! 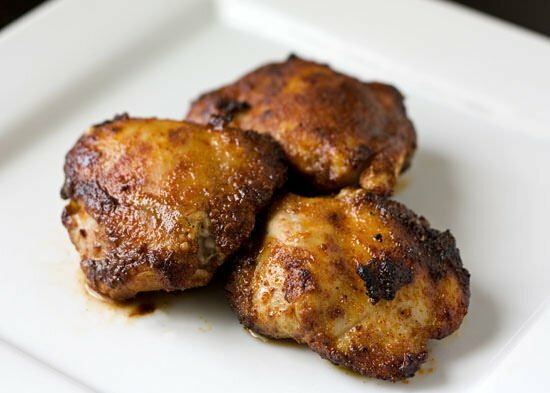 I love finding new recipes for chicken thighs…they are so much cheaper, and stay so much moister than chicken breasts. This looks so good! I might have to start using thighs. This IS really tasty! I found in in CL years ago and it's become one of our staple recipes. Yum! Newlywed & Liz- I love chicken thighs!! Karen- Its one of CL's most popular recipes… I can see why! So easy, I'm definitely going to try this!!!! Yum! I love these types of easy night home cooked meals! Thanks for sharing. I love thighs and this recipe looks amazing! Quick, simple, and with complex flavors. I might try substituting agave nectar since my husband is a diabetic. So glad to have another thigh recipe to use! Thanks! Perhaps it is time to give thighs another chance! The flavor sounds amazing here. Were you planning on mentioning that this is the exact recipe from Cooking Light's book? Hi Anonymous (I wonder why you chose not to leave your name? Hm.) I actually did mention right underneath the title of the recipe that it is from Cooking Light, with a link back to their website. I made these for dinner tonight and I must say that they were a welcome change. I paired them with rice and green beans and it was delicious! Please explain what you mean by “broiling”. We made this for supper tonight. It's a keeper! Thanks for sharing. Looking forward to making this tonight and I am glad to see Karen's recent review of it. Thanks so much for sharing this recipe on tastespotting. I made this last night (YUM!!) and posted it on my blog today. Can't wait to make it again! This was delicious! I pan-fried the thighs in a bit of olive oil instead of broiling since I've never been very good at broiling and they turned out fantastic. I had been searching for a recipe like this–sweet, spicy, with a nice crust from spices, and simple–so I'm delighted to have found your site (through foodgawker)! This dish was ready in about 10 minutes (maybe less). It will be a staple in my kitchen from now on! I've made this many times, but I use it as a sandwich. I melt some provolone cheese on some bread in the broiler, then i spread some basil pesto on it, put the chicken on one of the slices of bread, then I melt some butter in a pan and grill them kind of like grilled cheese sandwiches….SO GOOD. I made these tonight for dinner. They took a bit longer to cook all the way through than the recipe called for. The chicken smelled really good and tasted great. I think it would taste even better BBQed on the grill. Love the mix of spices. Hi, I want to try this recipe tonight, but I have bone in thighs and drumsticks…will the recipe still work if I have the chicken on the bone, or do I need to alter the cooking time? Thanks! @sdtchica13 Yes, you will have to increase the cooking time to make bone-in chicken. About 10 minutes per side should be a good starting point – just make sure the chicken has an internal temperature of 165 degrees F before serving. I make this very same recipe. Once, I was out of the rice vinegar so I decided to sub balsamic vinegar. Try it!! It's amazing. I could drink the sauce right from the bowl!! Wow. I just made this tonight for dinner and it was SO good. I skipped the cumin as I'm not a fan but the flavor was excellent. And so easy! Thank You. I'm in total agreement on the recipe rundown….Easy, quick & great tasting. Added bonus is that chicken thighs are an economical cut of poultry. Thanks! Would this work just as well on the grill? Sounds so yummy! This was delicious! I didn’t have the bonless/skinless thighs so I used chicken breasts and pounded them. Otherwise, I followed the recipe exactly and they were moist and tasty! Thanks for sharing this recipe. WOW!! I made this for dinner tonight and it came out AMAZING. My husband was so pleased, he called his parents to brag. I would say that this is a HUGE wifey success. Thanks for sharing! You can use bone-in thighs, it will take longer to cook with the bone. I’d increase the cooking time (it may take up to double the time) and have an instant read thermometer on hand to test whether the meat is done. I made this for dinner and I just wanna say this is DELICIOUS! I will most certainly be keeping this recipe. Might I recommend to get thighs WITH the skin on! The meat stays so moist and the skin gets nice and crispy and it is SO GOOD! I found this recipe through Pinterest! Made this for dinner last Saturday. Followed the recipe exactly and hubby and I both loved it. So flavorful and so easy. This one is definitely a keeper — I’m already looking forward to making it again. Hi Tessa – This is a long overdue “thanks” for this recipe. I have made it dozens of times and it has become a favorite weeknight meal for us. So easy and delicious. Love your blog!